Rajasthan Berojgari Bhatta 2019 Online Form:- The Department of Skill, Employment and Entrepreneurship (Employment Wing) Rajasthan has been increase the Berojgari Bhatta from 2019. Now the Department provide 3500/- for Unemployment Boys & Girls. Applicants who want to apply the Rajasthan Berojgari Bhatta Online Registration Form 2019. They can check the Online Form Eligibility Criteria through this page. For more information check the below details. 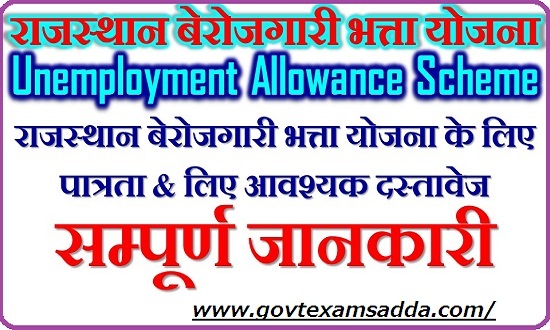 Candidates who are willing to apply the Rajasthan Berojgari Bhatta 2019 Registration Form offered by Department of Skill, Employment and Entrepreneurship (Employment Wing) should apply as per given form. We recommend to all before applying Rajasthan Berojgari Bhatta Online Form, Check the Rajasthan Berojgari Bhatta 2019 Notification completely. Check Eligibility Criteria conditions also in which you are searching for admission and after ensuring Rajasthan Berojgari Bhatta 2019 Eligibility Criteria, go ahead to apply. Contenders who are planning to apply the राजस्थान बेरोजगारी भत्ता ऑनलाइन रजिस्ट्रेशन फॉर्म 2019 including eligibility, online process, criteria and important details. Rajasthan government has given a fantastic gift to the unemployed youth of the state. Now this scheme will be given Rs. 3500 /- per month for every youth of the state. For more updates you can tune here on regularly basis. The Department of Skill, Employment and Entrepreneurship (Employment Wing) has announce that the Unemployment Candidates of Rajasthan can apply the Rajasthan Berojgari Bhatta Online Form 2019 through online mode. If you have want to Register under Berojgari Bhatta, Then you can apply the Rajasthan Berojgari Bhatta Online Registration Form 2019 from now. The Rajasthan Berojgari Bhatta Online Registration starts form now. वो सब कुछ जो आप जानना चाहते है ? Q. किस उम्र तक बेरोजगारी भत्ता मिलेगा ? Q. अब जो रजिस्ट्रेशन कराएंगे उन्हें लाभ मिलेगा ? Q. कौन से दस्तावेज लगाने होंगे ? Q. मेरा जन्म राजस्थान में हुआ। मैंने पढ़ाई बाहर की तो भत्ता मिलेगा ? Q. मैं निजी कार्य करके कमाता हु, भत्ते के लिए आवेदन किया तो ? Q. दूरस्थ शिक्षा से स्नातक है, तो ? Q. सरकार पर कितना बोझ आएगा ? बेरोजगारी भत्ता योजना के तहत आवेदक को 12th पास होना चाहिए। इसके साथ साथ उसके पास ग्रेजुएट अथवा पोस्ट ग्रेजुएट की डिग्री होना भी अनिवार्य है। Under the Unemployment Allowance Scheme, the applicant should be 12th pass. Along with this, it is also mandatory to have graduate or postgraduate degree. एससी व एसटी को आयु सीमा में 5 वर्ष की छूट दे है| Under this scheme the applicant should not be employed for 21 years and more than 35 years. For SC/ST candidates age relaxation for 5 years. बेरोजगारी भत्ता राजस्थान राशि की तहत प्रदेश के बेरोजगार युवक / युवतियों को 3500 रुपए की आर्थिक सहायता प्रदान की जाएगी। Under the Rajasthan unemployment allowance, financial assistance of 3500 rupees will be provided to the unemployed youth / women of the state. We have provide here the complete details regarding the Documents which is mandatory at the time of apply the Rajasthan Berojgari Bhatta Online Registration Form. So you can check it carefully. First of all, Visit the Official Site of Rajasthan Employment Portal. In the New Page, Applicants create SSO ID for register online form. Now open new page, Enter Complete Personal Details & Mobile No. & Email id also. After Registration login Id & Password send your registered mail id & mobile. Now Re-login official site @ https://sso.rajasthan.gov.in/signin. Fill the complete information & Submit the online form. Save & Take a Hard Copy for future use. Aspirants who are curious to know about Rajasthan Berojgari Bhatta 2019 Application form, We have to suggest them that they can check the complete process of Berojgari Bhatta online form. So you can visit here regularly basis. If you have any query or doubt regarding Rajasthan Berojgari Bhatta online Registration Form 2019 then you can comment to us. Sir According to berojgari bhatta registration, 2 members from single family can apply. But I have registered on EEMS Portal and when I go for my sister’s registration, it shows Unique Identification Number is already used in another registration.